February is Rotary’s Peace and World Understanding month when our district conducts Fast for Hope (FFH), our annual international project. Fast for Hope is a program unique to District 5960, although many districts undertake similar efforts. In the early days of the program, District Rotarians were asked to skip the meal during their Rotary meeting one day per year and to instead donate the cost of the meal to a district international service project, hence the name "Fast for Hope." Over the years, our district has raised significant sums of money, which have been used to fund projects throughout the world. In 2003-2004, our district began a three-year collaboration with District 5950 on the Haiti Safe Water Plus project, which also involves Haiti Outreach and World Vision as co-participants. We extended our commitment for a fourth year which concluded during the 2006-2007 Rotary year. During this four year effort we raised over $135,000, bought a new well drilling rig to replace one that was lost in a hurricane, built over 60 news wells, repaired 10 damaged wells and built over 200 latrines. To use a "macro approach", in other words to attempt to address in a particular village, multiple significant problems simultaneously. This is different from in the past were have tended to work on a “project” that benefits several villages. To provide meaningful volunteer opportunities for Rotarians and their families. A program that can be replicated. Reasonably easy travel to the country as well as within the country. Presence and support among both local Rotary Clubs as well as the community. That the effort be sustainable over time and have significant impact on the community. That the government is relatively politically stable and relatively corruption free, especially at the local level. That we be able to qualify and quantify progress. The countries that were initially considered were Nicaragua, Guatemala, Honduras, El Salvador and Southern Mexico. After further evaluation Nicaragua was initially selected. 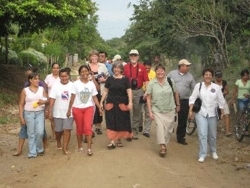 During 2007, two delegations of Rotarians from our district traveled to Nicaragua in order to further determine if Nicaragua met the selection criteria of the task force and to begin to explore Fast for Hope opportunities in Nicaragua. 82.3 % of the population lives on less than $2 a day. After visiting a variety of opportunities, our District has initially selected the Masaya Rotary Club and the village of Las Cortezas to work with. Masaya is about 30 miles from Managua and Las Cortezas is a village of about 1,225 residents, most of whom live in extreme poverty and there is currently no other nongovernmental organization doing work there. There are two significant differences between this year's Fast for Hope effort and efforts in prior years. That we are focusing on one village, but rather than tackling one project our objective is to simultaneously address the myriad of factors which are interconnected and that cause extreme poverty. It is our conviction that by helping Las Cortezas with the broad range of interconnected issues they will be able to extract themselves from extreme poverty. That while we can assist and inspire, the villagers themselves must identify their needs and potential solutions. This becomes extremely challenging in a community where because generation after generation has lived in extreme poverty, the villagers have come to believe that living in extreme poverty is a condition that they are destined to experience the rest of their life. It is very difficult to teach people how to identify what they need to do and can do to change this condition, when their entire effort and focus in on surviving to the next day. Yet it has to be done in order for this effort to be effective. These two elements in combination form the cornerstone of sustainable community development. There are two ways you can help in this effort. By donating $25 or more as part of your club’s Fast for Hope fund drive. The goal is for every Rotarian in our district to contribute $25. As this effort progresses this spring there will be a variety of ad hoc task forces formed to help with different aspects of this effort. If you are interested in participating please let this year’s Fast for Hope Chair, Dave Newman know of your interest. Thanks in advance for your generous support of our district FFH!